I have had too many birthdays, parties, and other celebrations on my calendar lately. Don't get me wrong; I LOVE to be part of all the fun. It's the planning that kills me. With all the tasty looking things on Pinterest begging me to try their complicated recipes, it can be tempting to waste an afternoon making a messy treat. But this idea is super simple. Really. To make it, simply take a box of Mrs. Freshley's Candied Fudge Brownies and sandwich your choice of ice cream (I picked chocolate) between two of the brownies. Use a knife to cut away "excess" ice cream, and place the entire treat in the freezer until you are ready to serve. As you can see from my photo above, any stray candies look pretty sprinkled onto the ice cream portion. 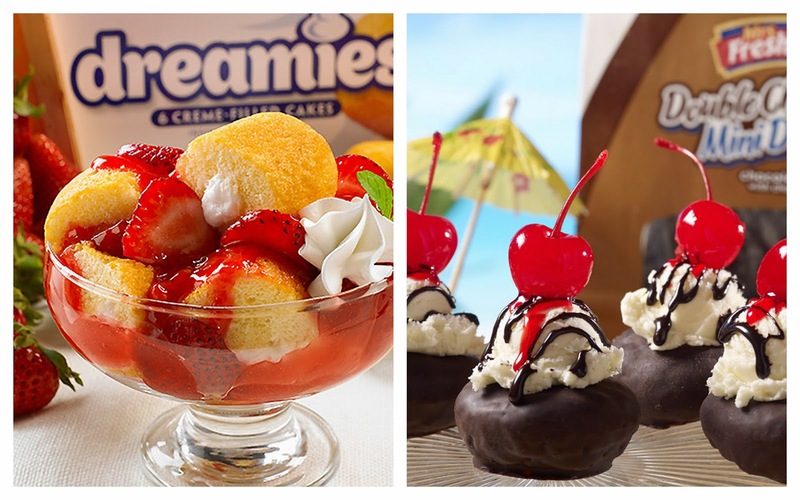 The treat on the left is a Dreamie Strawberry Shortcake, and the ones on the right are Double Chocolate Mini Donut Sundaes. Both use less than 5 ingredients, including the boxed Mrs. Freshley's product! How would you personalize one of these dishes for your own birthday party, BBQ, or reunion?